Learning Alias sponsors the Education of children in Nepal. This is Deepana and we need to raise money to put her through Nursing College in Kathmandu. Learning Alias Blog is a free service, but if you would like to show your appreciation, please make a small donation. 100% of your money will go directly to pay her college fees. Thank You, graham bullock. 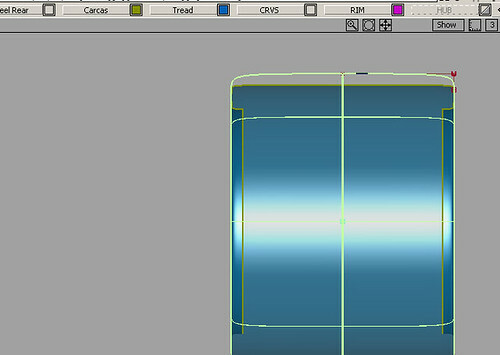 In the Perspective view go to >palette>surface>revolve tool and and set it up as shown.Select the rim crv. and make a 36 deg. revolved surf. 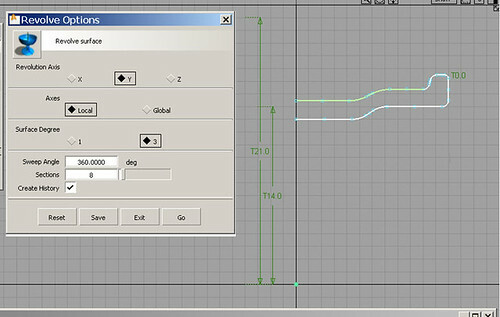 from the Z axis (Important set the tool to revolve on the “Y” axis)Make a new layer, call it Rim and assign your surface. 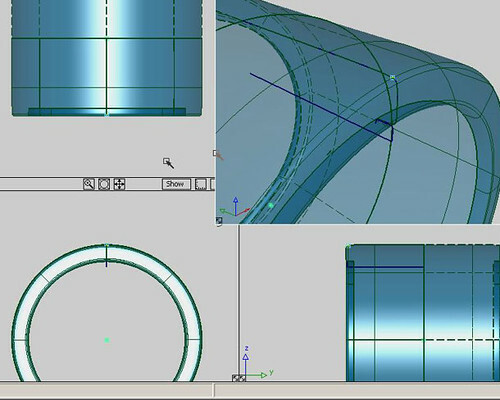 Typically the hub would be either flush with the rim in the plan view or slightly inboard of the outer rim flangeBuild your curves up from the Y axis.>palette>curve edit> curve fillet tool and create fillets on the top outer and top inner corner of the hub crvs. (If you create history whilst you are using this tool, it wont work, so just select the offending crv. and delete its history >delete>delete construction hist. )Revolve your hub crvs. 36 deg, exactly as you did your rim. Create a new layer and name it Hub. Assign your surf.In the Left view snap a circle to the origin LHM+Alt.Scale circle to the size that you want your center cap to be, then copy and paste the circle (In this tutorial copy and paste is always Ctrl+C, Ctrl+V)The copied crv. is now active, so scale it down 5mm in its radius to represent the milled hole which will run through the center of the cast wheel. 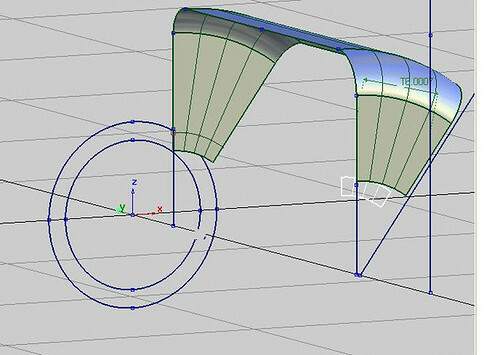 In the Left view project your 2 circles onto the hub’s front and back surfs.Trim divide to create a “C” shaped surf, which will be the milled land to allow the center cap to be driven home. Delete the 2 small triangular surfs. 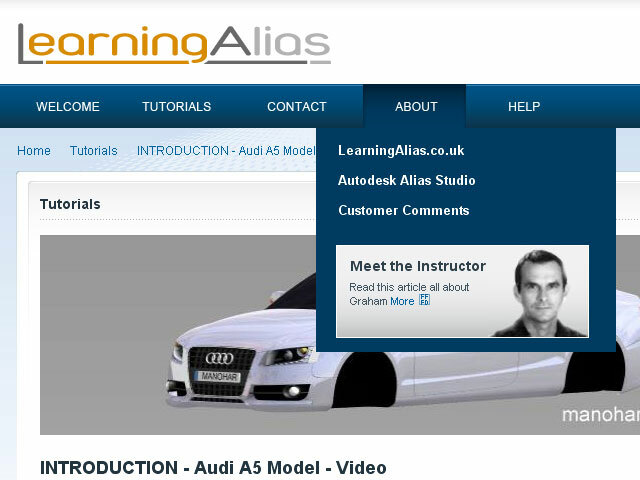 And also you should complete several of the fantastic tutorials on the Alias Design website. 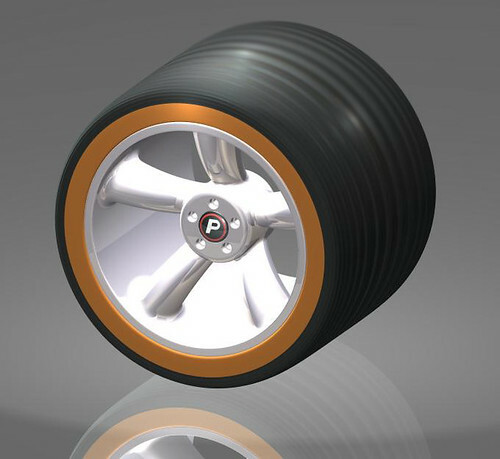 The whole point of this tutorial is to show you how to make a Simple wheel, which has VERY light geometry. 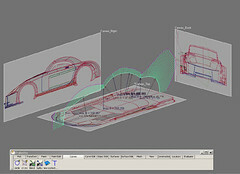 When I build a complete Alias automotive exterior I build the wheels in a separate stage, save it as a separate .wire and import it into the parent model ONLY when I need to either evaluate the vehivle aesthetically or render the complete vehicle. 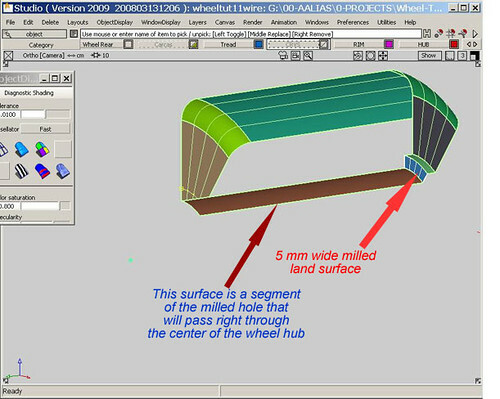 Alias Wheel Tutorial – part – 1Author: graham bullock B.Ed. Design and Tech. 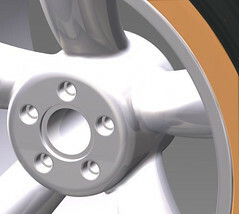 A more realistic rim section would start to look like this, but it is not really needed for a simple styling wheel. 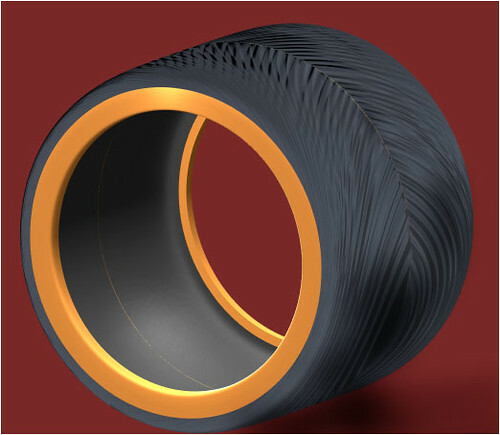 Go to the perspective view and place the 1st point of a new curve [ New Curve( CV’s)]on the outside, upper edge of the tyre carcass revolve curve. In the front view build the rest of the curve by adding 3 more cV’s. 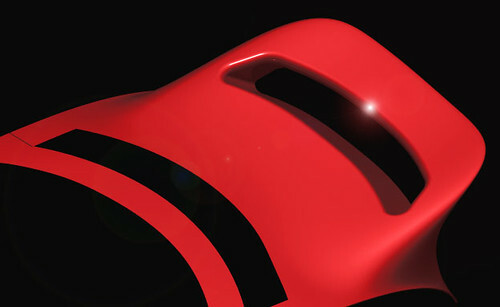 This curve will be the revolve curve for the tread surface. The 1st CV is the bottom edge of the tread, vertically above it (front view) are Cv’s 2 and 3 on top of each over and the 4th CV is horizontal to them on the Y0. (When you form your revolve surf. and turn on layer sym. you will have tangency “G0” . NB: I mirrored my crv. accross and checked it with a curvature comb. I recommend that you use curvature combs at all times. Working without them always leads to disaster sooner or later. I am a top flight Alias Trainer/Modeler, specializing in taking students who are either currently studying or who have left college/university and want to learn the skills they need to reach Alias Automotive Entry Level. I offer the best Alias training deal on the Planet! Student Discounts up to 50%: Discounts are available for students enrolled in full-time education. Price on application. If you wish to apply for a place, please email me with all your details. 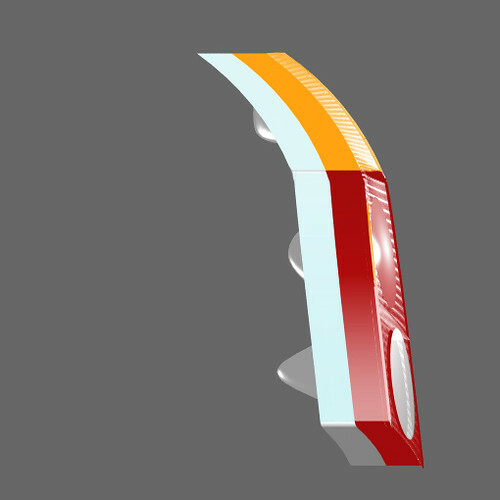 Alias Studio Rear Lamp Assy. If anybody ever asks you to build a complete rear lamp assembly. Throw your appointment book out the window, because you have just been lumbered with a really difficult task. 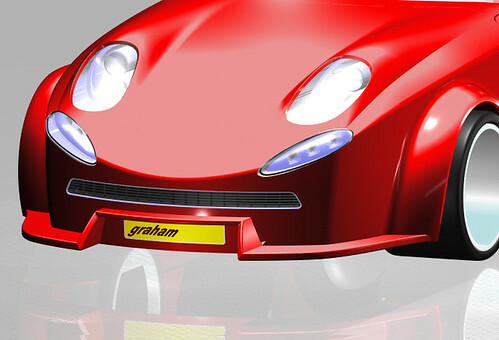 Like most things in Automotive modelling, you don’t even have one datum surface to kick-off modelling from, so how do you start?Go into the back view and build a set of curves in the True View, which define the outline of your lamp cluster. There are only 2 views which you need to think about this is the most important. The second view is the left/side view, where the unit wraps around the rear corner of the car. When you do this you’ll definitely get the profile that you desire from the rear view, but what your lamp is going to look like in the right view is going to depend upon the surface shape of the rear corner of the car. 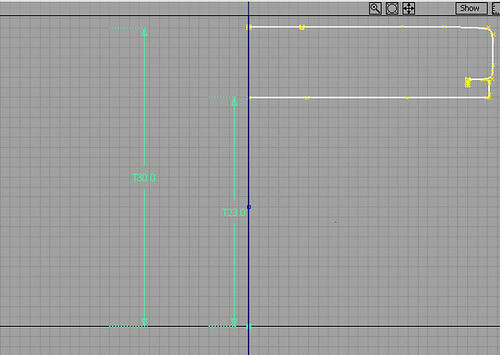 It might be great, but normally it will be pretty horrid, so you may have to make a separate set of curves to project in the right view. Don’t worry if the 2 sets of curves don’t marry up, just modify your left view curves until the c-o-s updates with history and you have both sets of curves meeting as you require. USE CURVE COMBS AT ALL TIMES!!!! Yes you can just like you do with any other intersecting curves.Which is the hardest part of making a lamp assy? The lenses are by far the trickiest part. Getting GO at the edges is really hard and if you don’t have GO then you can’t fillet them. This is very important if you are making a pre-production model, but if it’s going to be milled into a hard model or modelled in clay, it’s better to put the fillets on at that stage. 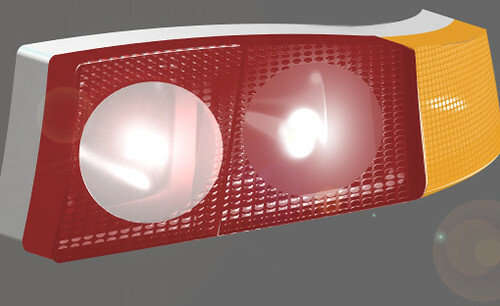 I have been working all day learning how to make a complete rear lamp assy. complete with reflectors, tri-coloured acrylics and obscuration textures.The top curve is no good, so today’s work flow goes down to a tough practise session in which a lot was learned. Today I cut a large slot through the rear spoiler to give a lighter feel to the model I did this by building a rectangular curve set, duplicating it. Moving the top set forward and the lower set rearward. 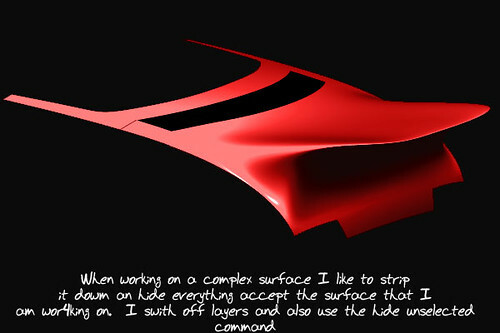 I then skinned a surface between the 2 sets and intersected it with the integral spoiler. Once I had trimmed away the protruding parts of the skin surface I trimmed out the top and bottom apertures in the spoiler. To prevent loosing valuable work flow whilst trimming. I always save out my work before trimming anything that’s tricky. I do the trimming,but don’t save the trimmed work flow until the trim process has been successful. This has saved me countless heart aches. I save anything up to 100 different versions of the work flow. I make sure to date each file as I save it. This makes it easy to find the version you are looking for when something has to be binned or you need to import a part of your model which has been deleted erroneously. This often happens whilst trimming. Does This Car Have A Rear End? For weeks I have been showing you the front side and top of my Model, but I got an e-mail asking to see the rear end, so I thought I better spend today building one. 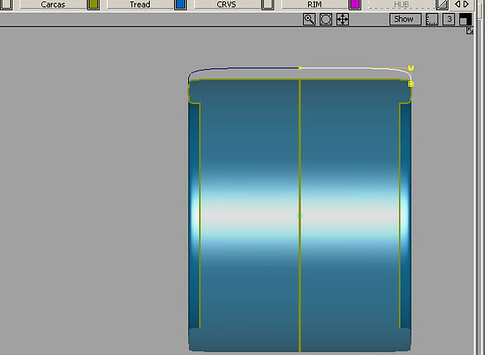 Basically I built a lovely full volume center surface with good highlights and then I went Berserk and after projecting a curved rectangle onto the rear surface in the top view, I built a rectangle piggy backed onto it, pulled out the CV’s to create the big reverse louvre (Air Scoop) you see. By spending about an hour setting this tool up to work the way I needed, I was able to pull a massive spoiler out of my combined volume. This is not the way it would be done in the Automotive Industry, as it is not an accurate way to work and leaves you with forms that are very difficult to modify, but I really wanted to see just what this tool would produce. you’d be modelling away and you’d get at least one visit a day from the stylist, asking for changes to your model, so you’d need a fee standing spoiler, that could be easily changed of substituted . 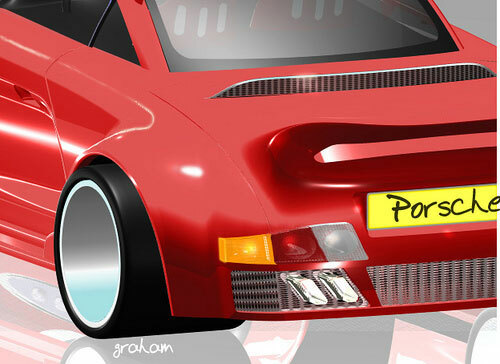 As you can see I’ve gone mad and created a rear spoiler. I personally made the clay model for the Audi TT rear spoiler back in 1999. Rear spoilers are tricky beasts. 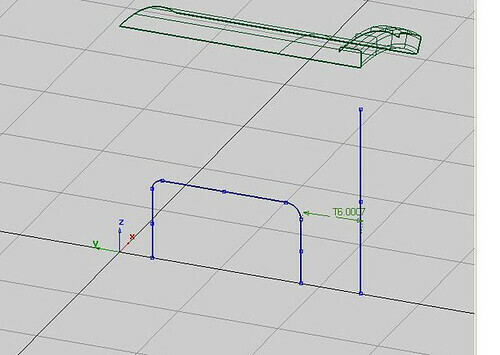 There are no datum surfaces to measure from, but us Alias modellers live in that crazy world. 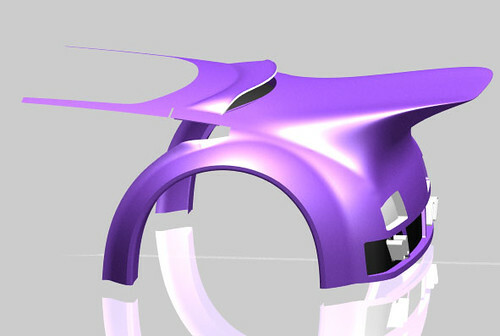 Make an ellipses in the top view and project it onto the body where you want your spoiler uprights to stem from. 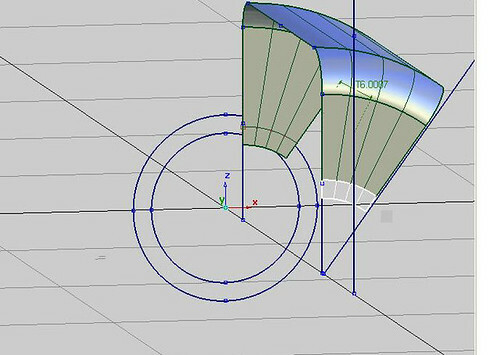 Make a smaller ellipse and move it vertically up and back a bit from the base c-o-s. Run a skin surface between these 2 ellipses to surface your supports. 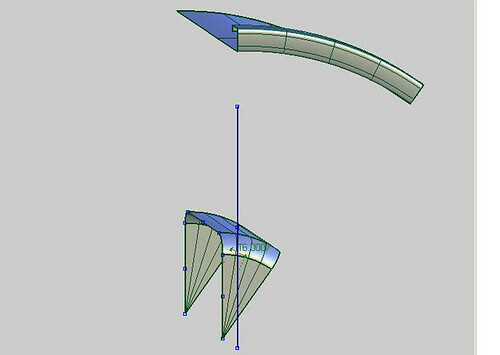 Build 3 cross section curves for your spoiler wing . That’s 1 on the LHS, 1 on Y0 and mirroe the LHS over to form no. 3 on the RHS. Now skin the 3 curve sets hold down shift for the 3rd one. 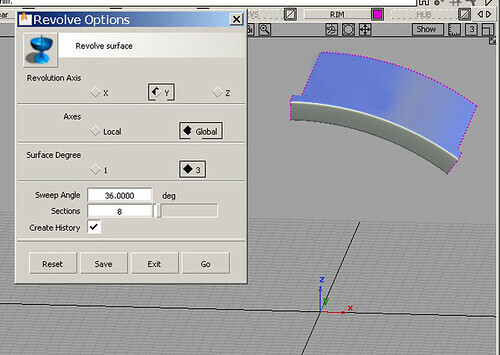 Close the open ends of the wing off with a planar surface or a surface which is appropriate for your model. 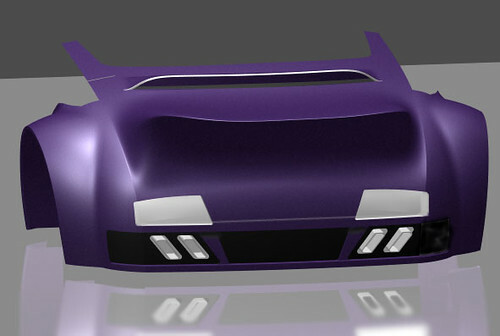 Top view, project an trim divide to form the movable aileron and allocate a different shader to it. I have a 3mm parting line , but you can’t see it in the little jpeg. 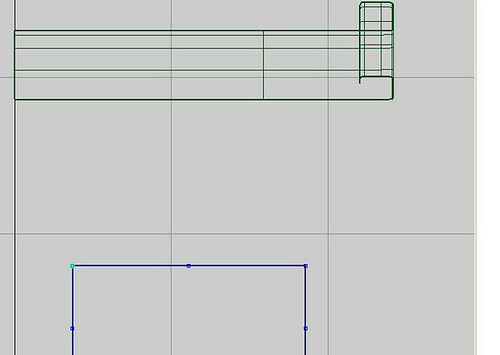 However complicated the surface intersection of say a spoiler or mirror maybe, I always start by projecting curves onto the parent surface to for c-o-s to build from. NB: I’m still on the most basic wheels possible. Just like designing a car exterior in the automotive industry, where the only import thing about the wheels for the first few years of a project is the dimensions. The wheels ate the icing on the cake and come last. Thanks Abdul for Reading My Site and for your Compliments Regarding My Models. 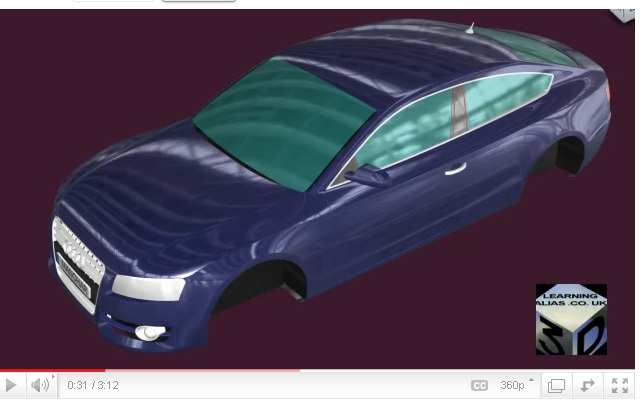 As a general comment to anybody learning Alias Automotive modelling, I wouldn’t recommend that you spend too much time on wheels in the early stages of learrning to build a virtual car. It’s far more important to learn to set up your Stage with Image Planes or Canvases and to set up your grid with the correct dimensions and then learn to produce perfect curves upon which the quality of your surfaces will depend.Also I strongly recommend that you do all the Alias Studio Tutorial Modelling Tutorials, starting with the chair and then going on to do the shower gel bottle and then the teapot and the mouse etc. 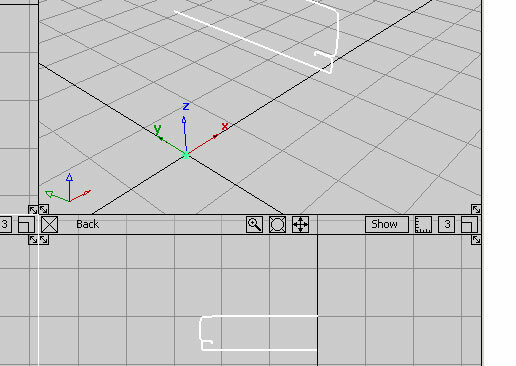 These tutorials are where you learn the solid basics of working in and understanding Alias. IMHO every tutorial you do will teach you some new and deeper level of Alias.Sorry my images are not displaying. I’ll get it fixed real soon!To Learn Alias Automotive to Industry entry level has been made easier. Why not visit my website and take a look for your self? Please donate just 1 Eur/1.3 USD. Why not take 2 min to do it now? Learning Alias sponsors the Education of children in Nepal. This is Deepana and we need to raise money to put her through Nursing College in Kathmandu. Learning Alias Blog is a free service, but if you would like to show your appreciation, please make a small donation. 100% of your money will go directly to pay Deepana’s college fees. Without the help of sponsors in the developed world, Deepana would receive no education whatsoever, as she comes from a remote Hymalayan village. Thank You for your kindness, graham bullock. I built some projection curves and projected them onto the front surface to get curves on surface. I trimmed out the aperture using trim divide and moved the piece I had cut out backwards to form the back surface of the grille box. I made the grille box by running the Tubular Flange tool around the aperture < Single Surface, so you build the grill box fillets and draught surfaces all in one go. I set the Tubular Flange tool to < Radius 5mm < Flange depth 200mm. I then selected the tubular surface and assigned it a chrome shader. 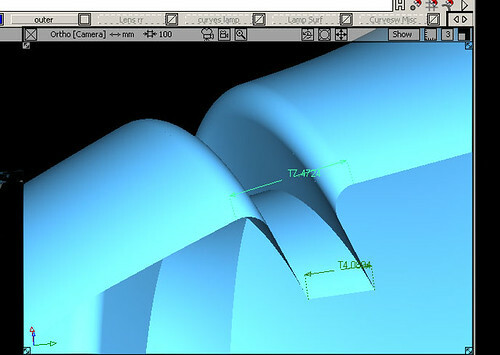 I took a Duplicate Curve from the top outside edge of the tubular surf. and moved it down Z to where I wanted my first louvre to be built. Then I created a nice louvre cross section with a single curve and extruded it. Having done that I duplicated 4 extra louvres with < edit < duplicate < object. Most students have a lot to learn about parting lines. Around the door he went for a 10mm wide parting line. That’s the total width including the surface fillets. This is too wide if truth be told, so as the whole front of my car lifts and hinges forward like the Jag.E-Type. Here he has used a 3mm wide shut line. This is too narrow and after rendering and reducing for the web. you can hardly see it. In real life manufacturers use a variety of widths and shut lines on Commercials, 4 by 4’s and budget priced cars can be 10 -15mm wide. Expensive quality cars will typically have very controlled Parting line widths of 5 -8mm. the volume of your model must be closed, so that other down-line software will accept the data originating from Alias. Parting lines must have a bottom surface, either generated by the parting line tool or direct modelled using Sq, Rail or Skin surfs. 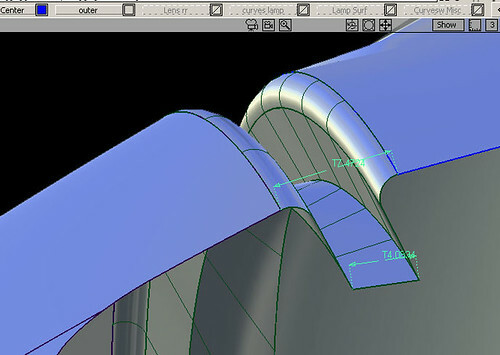 Demand that parting lines are closed off, without any gaps, so you should use the Check Model tool to see where any problems lay and then fix all the problems before you model is exported, as a Shell, IGES, STEP file etc. and if you want to accelerate your progress to Ind. Entry level, why not sign-up for one of our Pro. Modelling courses now? 167 Euros (200 USD equivalent Nov.2011) per month. You get your .wire reviewed by me every 15 days and you will receive : feedback, instruction, tips and advice from me personally. Access to all videos including my ” Private Student Training Videos”. You will build at least 3 complete automotive exteriors. The course also includes an intensive Reverse Engineering section, which required by most employers and is often given as a practical test at interviews.